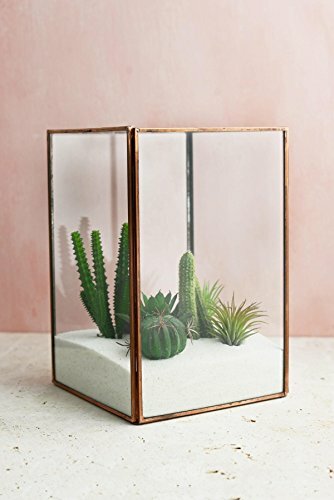 Add warmth to your living room by lighting pillar candles in the Glass Terrarium Display Case with Copper edges. This display case can also be used as a terrarium when filled with sand and cacti, or soil, moss, and small wood slices. A perfect display case for a wedding, this terrarium would make a lovely centerpiece for your banquet tables. It measures 9" tall and 6" square (5-5/8" square on the inside). This terrarium would make a lovely centerpiece for your banquet tables. It measures 9" tall and 6" square (5-5/8" square on the inside).